As we sat there in our lenders office I had a sick feeling in the pit of my stomach. That feeling? That we were going to get very little, if anything, from the sale of our house. In all honesty, it’s not that surprising that our house was not the cash cow many believe they can be. We bought at the height of the housing boom. We put nothing down and got a lovely starter home. As you can understand, it was only inevitable we wouldn’t realize any sort of gain. We’re told in many circles that a house is an investment. 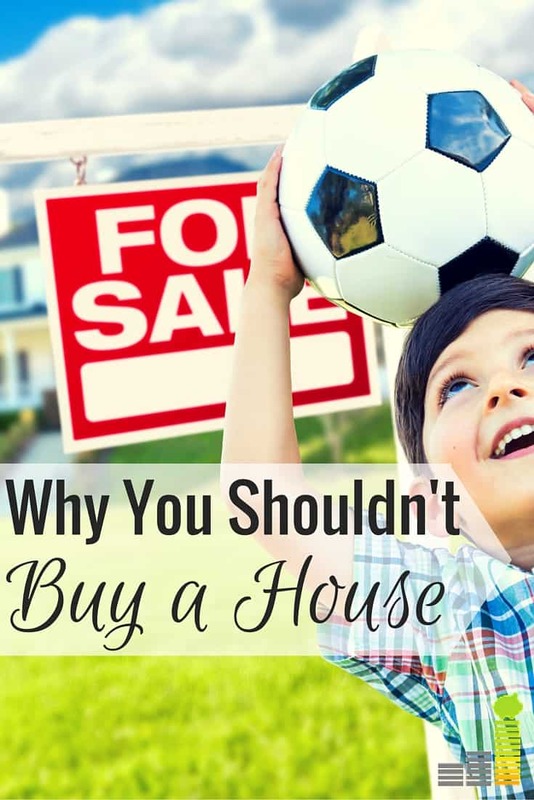 ‘If you want to go anywhere in life,’ they say, ‘you must buy a house.’ It’s as though buying a house has become a right of passage in many circles. A lot of this goes back to the foregone belief that owning a house is part of the American Dream. This message is spread by the media, politicians and beyond. There’s one small problem with that message. A house, in many instances, is simply not an investment – it’s quite an expensive luxury in fact. Unless you live in a high demand area, or some other unique circumstance, a house isn’t going to be an investment in the true sense of the word. An investment, in the purest sense of the word, should provide you a tangible return. Whether that is investing in yourself to advance in your career (and make more money), investing in the stock market to create income flow or some other income-producing venture, an investment is something that provides real return on some sort of regular basis. This isn’t to say you can’t invest in real estate. There are many who do quite well at that, but that’s not my point here. There’s one major problem with the belief that you need to buy a house to follow the American Dream. It’s assuming everyone wants the same thing and if you don’t follow the crowd there’s something wrong with you. We saw it ourselves when looking for our new house. We were told that if you’re truly middle class your new house will have a three-car garage. Really? Class level is determined by the number of cars you can house in your garage? I get the argument on one level since bigger is usually viewed as better, but why concern ourselves with what the Joneses are doing? They aren’t paying your mortgage, so you need to do what’s best for your situation. In some instances that may mean it’s time to buy a house. In other instances it may mean it’s better to rent. Ultimately, it comes down to doing what’s right for you. You need to put yourself in a winning position and many times that may mean the flexibility that renting affords will suit your needs best. But, in order to know what will be best, you need to look at what’s best for you and run the numbers to ensure it makes sense. We spent substantial time debating if we should buy a house or not. We looked at our finances, our goals and what we want in our daily lives. We knew going into it that we won’t see a meteoric increase in the value of our new house in the near future. That negative aside, we chose to move forward with buying a new house. In terms of an investment standpoint, we’re not viewing it as a traditional investment. Life, however, isn’t always about money but it’s about putting yourself in the best situation possible. We have a relatively unique situation with three young children and we work from home running virtually two businesses, as a result, we need something to fit with that. That must also fit with our desire to be completely debt free within the next ten years. As such, a rental was not the best fit for us. We wanted something that provides the flexibility we desire while at the same time putting us in the position to reach our goal. This is where the house as an investment hype gets lost. You need to do what’s best for you not what’s best for someone else. In a changing culture the flexibility of renting may very well be the best thing for you, especially if the other option will saddle you with something that holds you back – and there’s nothing at all wrong with that. Rather, you should focus on ways to increase your income to help you reach your ultimate long-term goals. Do you believe you need to buy a house to pursue the American Dream? Are homes in your area considered a true investment? If you currently rent, do you ever see a time when you’ll buy a house? We’d love to do the same thing though lack of time has held us back from pursuing it they way we’d like. That’s a good point Amanda. I would say the same thing and likely wouldn’t change from that in our current location. I can’t believe they said you need a three-car garage if you are truly middle class. I swear, people will say anything to make a sale or sell a more expensive property. That is absolutely nuts! Like you, we choose to own a home because we work at home and have kids. I want my kids to have a home base to return to like I did when I was growing up. Plus, I don’t really think renting is our style anymore. I know. Thankfully it wasn’t our agent and she worked with us to get the kind of house we want. But, several of the agents we interviewed told us that, as well as a few others. The sad thing to think of is how many of those with 3 car garages have more debt thanks to an extra car or extra stuff they buy to fill it with. I once had someone I just met at a party ask me if we had a three-car garage. I was stunned. What a weird question! Viewing a home as primarily a residence, rather than a investment, goes a long way to keeping your expectations reasonable. It also frees us up to live in it, rather than constantly worrying about its value. I know! Truly weird in deed. Good point Kalie. I think viewing it as your residence helps keep that value to you in check and more focused on growing your overall wealth. I think you hit the nail on the head when you said “We’re not viewing it as a traditional investment.” Home ownership is okay, as long as people understand that. We know people that are still living in houses that are valued at less than what they bought them for right before the bust. The days of real estate “always rising” may well be over. You’re exactly right Laurie. It can be a great thing, so long as you manage it wisely and don’t give in to the hype. When buying a house to live in the payback comes when the mortgage is paid and your monthly expenses drop accordingly. With no mortgage or rent payments you now have hundreds of dollars to invest every month. The feeling of security when you own it outright is pretty nice, too. That feeling never goes away. I still invest in real estate but I don’t manage my home as an investment. Having that extra cash to invest each month would certainly be nice. It’s a big part of the reason why we want to be paid off within 10 years – we want freedom. I work with a guy who is in the exact situation – bought during the housing boom and likely won’t make much when they sell. Real estate is tough imo because people are constantly buying and selling due to moving for various reasons. I’m curious how housing returns will be over 10, 20, 50 years. Unfortunately seems like it needs to be a long-term play. Far too many are likely in that situation unfortunately. I’m curious to see how it will go over the near and long-term horizon. I’ve been reading about shortages and how that’s impacting things, but impact will remain to be seen. Renting makes more sense for me because I don’t know in which city I want to ultimately live. Once I decide on a place that I can see myself at for more than 5 years, I will likely buy (probably a condo). Completely understood Aliyyah, I’d do the same thing. Agreed. Each person and situation is different and there really is no right or wrong to the rent/buy debate, as long as you’re educated about your choice. That said, we chose to buy, realizing the house is not an investment. We hope to pay it off early so we don’t have a monthly payment. Unfortunately, there are always repairs! We’re in the same boat, and much why we want to be paid off within 10 years as we want the freedom. I know! Our garbage disposal broke the first morning we were here – it’s craziness. Real estate appreciates slowly, but it pays significant dividends. When you own your house, you get HUGE dividend in the form of a place to live. Unless you expect to move soon (because real estate transaction costs are massive) then it is almost always better to buy than to rent. 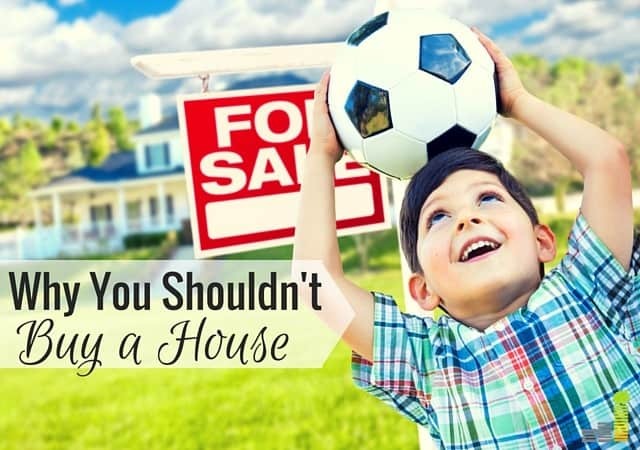 The mistake people make, however, is that they buy too much house, thinking that all of that “extra” house is an investment that will appreciate. In most cases, it won’t. The value of that extra space is in the housing “dividend” that you get, so it’s really just consumption. Get a mortgage that’s the same size as your rental payment. Good point on the transaction costs. Our old neighbor, who had only been there for a year, just put his house on the market and my wife & I were discussing how that can be painful financially. I agree on the extra space component. I feel our eyes get too big for us, we rationalize the extra space and see it does little, if anything, to improve us financially. I think residential real estate including primary home ownership can be a good investment, but only if you treat it like an investment. I’ve got friends who have done one live-in flip a year for the last five years, and they’ve made more from their flip than from their day jobs combined. We bought a house, lived in it for two years, and now it’s a high cash flow rental property because we bought it with renting it out in mind (same with the house we live in now). I think the biggest thing to decide is if you want to invest, then you need to treat your house as an investment, not a consumption good. If you want to live somewhere that you love, then you need to treat the money like it’s flying out the window. Completely agreed Hannah. We actually looked at the possibility of renting out our old house as a means to create some cash flow. After talking it over with several local friends who have rentals we really wouldn’t be clearing much, if anything, each month and thus not worth our time & effort. That said, if you view the house as an investment it definitely can be that way. Housing is so expensive in the NYC area that it’s definitely difficult for many to purchase a house. It is tempting to think of it as an investment in this region because you hear about the enormous appreciation that some people have gotten on their homes. I would bet it is Andrew. We faced a relatively similar situation when we lived in San Diego – demand drives up the price keeping many from buying. But, in situations like that, it’s easy to see why many view it as an investment. I think you’re right when you say that a traditional home isn’t the best investment move. However, there are ways to make it so – like, renting out spare bedrooms or getting a duplex where you can rent out other “apartments” in the house. I think this is the way to go if you are going to buy a home these days. I’m all for rental properties and earning an income / side income this way. Buying a house is definitely not always a money saver. We’re trying to buy one right now in a very aggressive market, and it’s ridiculous how much money people will offer for a home. We’ve stopped looking at houses as “money-making” opportunities and more so for the freedom we get from living in a house. For example, we would be able to garden, which we can’t do right now. It’s all about the costs and benefits to figure out what’s best for you.